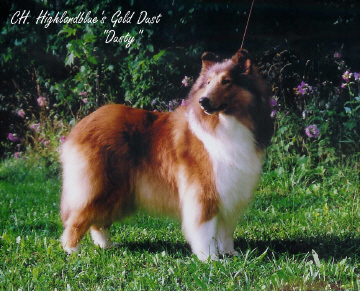 COLLIES OF BLUEHARVEST - The Performance Stars! Here we have all the Dreamalong dogs and Kathy and Meaganne posing for their pic as all are awarded their Rally Novice titles at the Blyth show July 2010. Brinx is pictured finishing his CD at the Blyth shows this summer 2010. Mom Kathy look so proud!!! 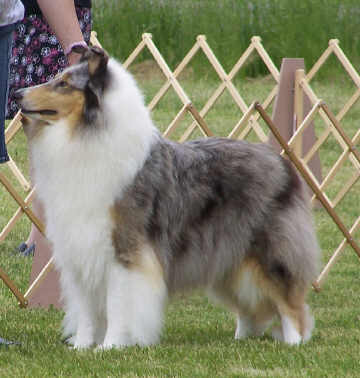 "Arwen" achieves the new title of Rally Novice at the Blyth shows July 2010 - quite a feat considering the heat! Way to go Kathy and Arwen!!! Phoenix is trained, owned and loved by Meaganne. 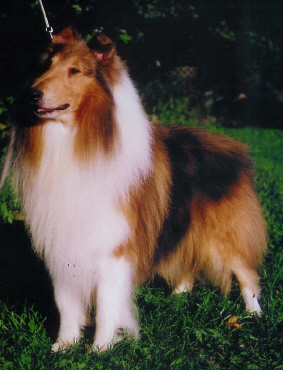 "GANGSTER" FLOYD GETS HIS HERDING TITLE! We are proud to say that Floyd can now add the title of HIC to his name; photos courtesy of our beardie friend Kelly Canham. Silver is shown working with her best friend, Heather. We couldn't be prouder of this girl, who has already also had her first litter of puppies, and could be thinking about a second some time soon. If you are looking for a performance puppy, look no further! Contact us! Frost is no longer with us; sadly he passed away in 2009, but his accomplishments and his zest for life will remain in our hearts forever.